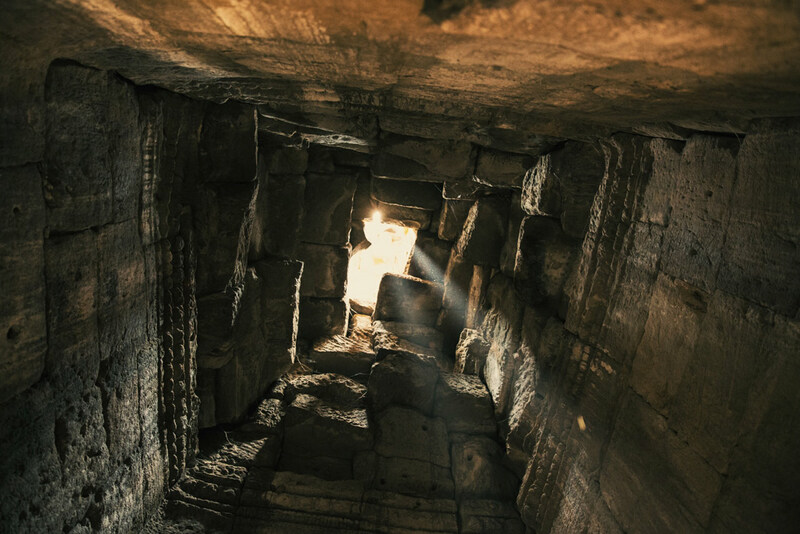 On what turned out to be one of the hottest days of the year in Cambodia this past April, I along with my guide set out to explore the atmospheric ruins of Angkor, the former glorious capital city of the Khmer Empire. 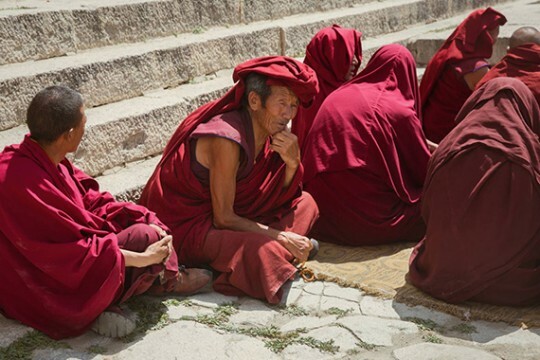 While the intense heat, reaching a scorching 40°C by mid-afternoon, is immensely unpleasant for exploring, it is a deterrent that helps keep the usual hordes of tourists away. 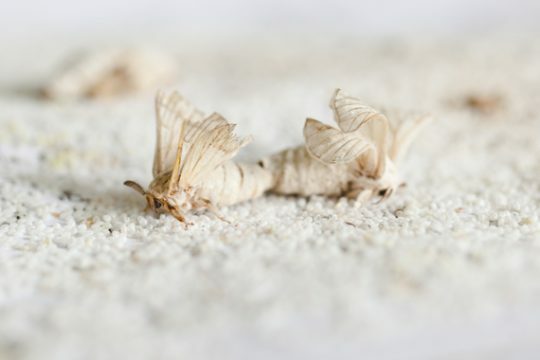 During those days in Siem Reap, bats were reportedly falling out of the sky – and in Battambang, dead monkeys were found by the roadside, many of them expired from dehydration. 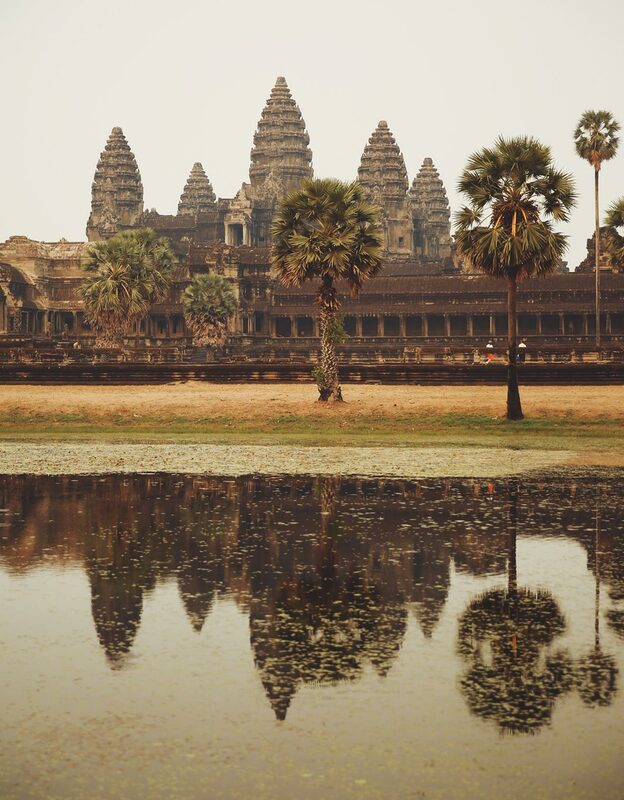 Angkor, which is a Khmer word, originally derives from the Sanskrit word nagara, which means “city”. 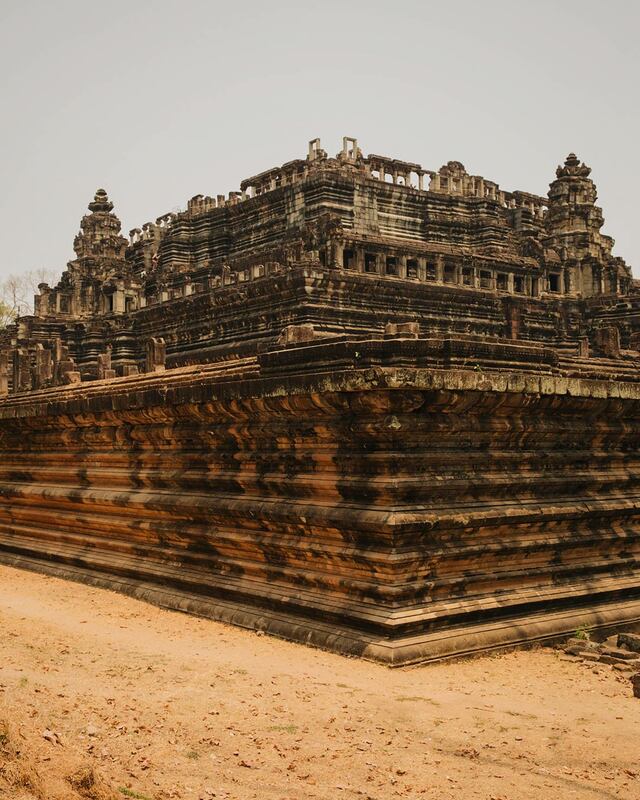 It also refers to the former Khmer capital city, located about five kilometers north of present-day Siem Reap. 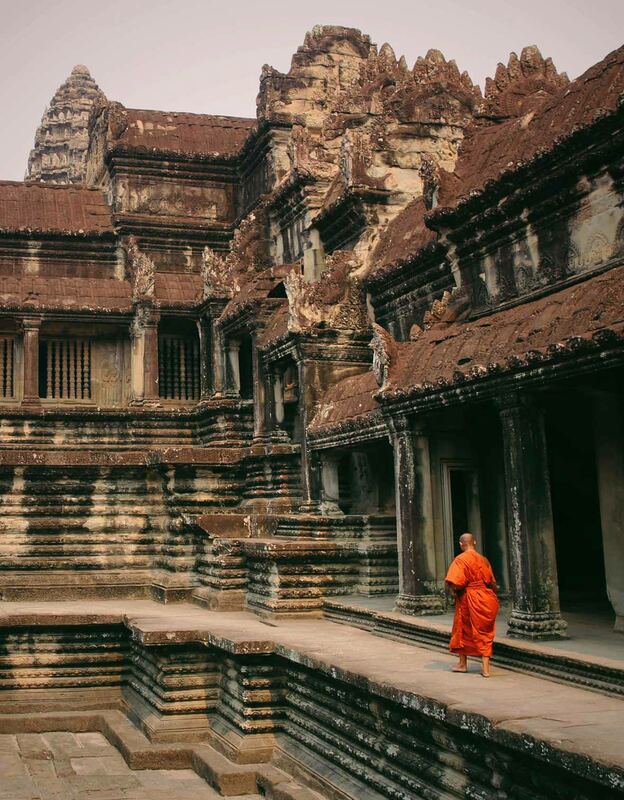 The ancient city contains the ruins of thousands of spectacular religious temples, including its most famous temple, the magnificent Angkor Wat. 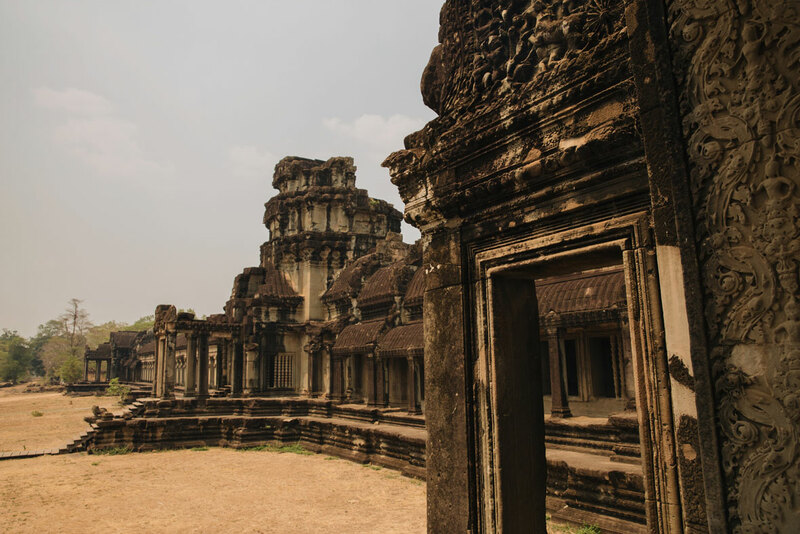 The Khmer Empire was one of the most important civilizations of southeast Asia; its territory once included all of Cambodia, parts of southeast Thailand, and northern Vietnam. 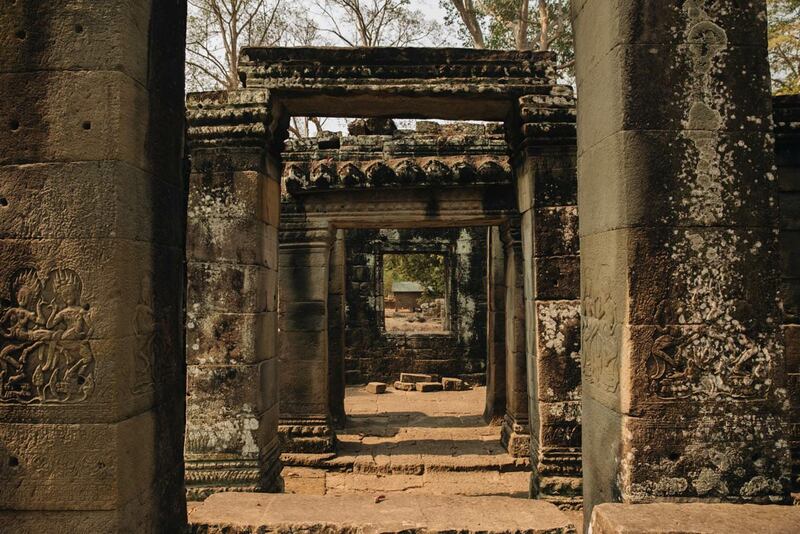 Angkor boasts an impressive medieval hydraulic system built by the city’s engineers, beautifully ornate architecture, and an extensive network of roads – but today all that is left are the ruins of structures, sometimes surreally overrun by large trees or left in a state of disarray. 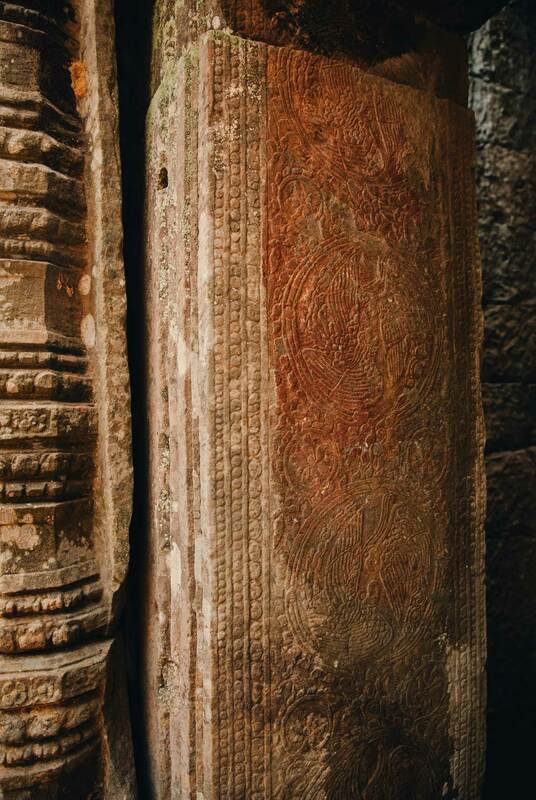 I started the day walking around the ancient Buddhist temple at Banteay Kdei and Ta Prohm with my guide, who made frequent stops to explain to me the meaning of etchings in the walls and the functions of the different chambers and enclosures we passed through. 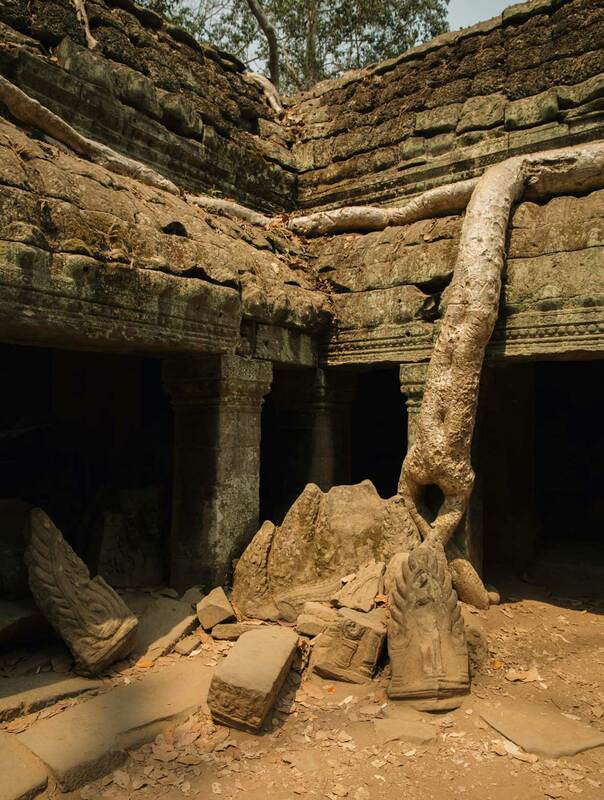 There were some visible signs of ongoing restoration work at Ta Prohm, but over the years, a lot of it has quietly been left in ruins – admittedly by the École Française d’Extrême-Orient, who led the early efforts to restore the dilapidated structures, as a “concession to the general taste for the picturesque.” With the passage of time, giant and imposing silk-cottom and fig trees have eerily and spectacularly blended into and grown on top of the structures. 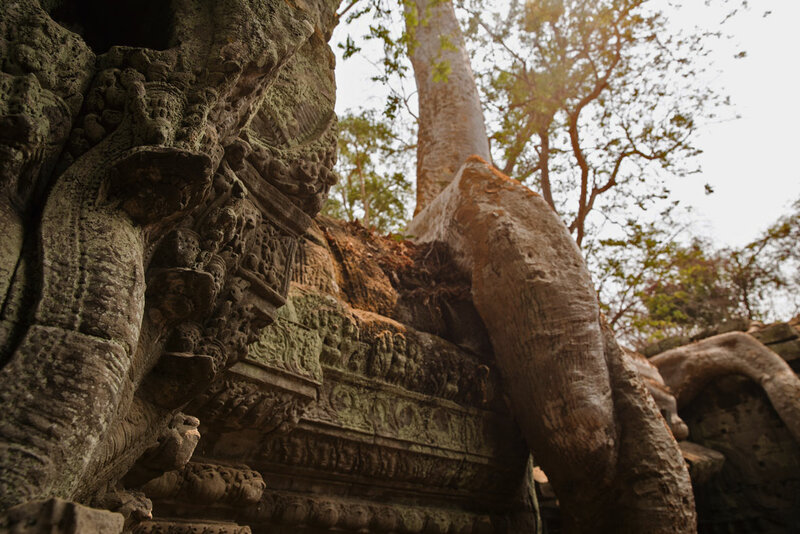 Originally built as a Mahayana Buddhist monastery and school, Ta Prohm was eventually abandoned after the fall of the Khmer Empire in the 15th century. 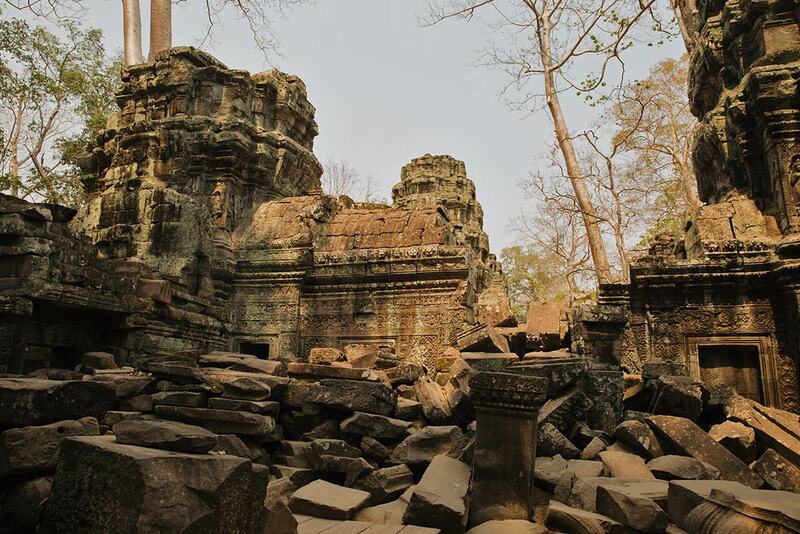 Like the rest of Angkor, it prospered for centuries but, after the mysterious collapse of the Khmer Empire, was abandoned and neglected for centuries. 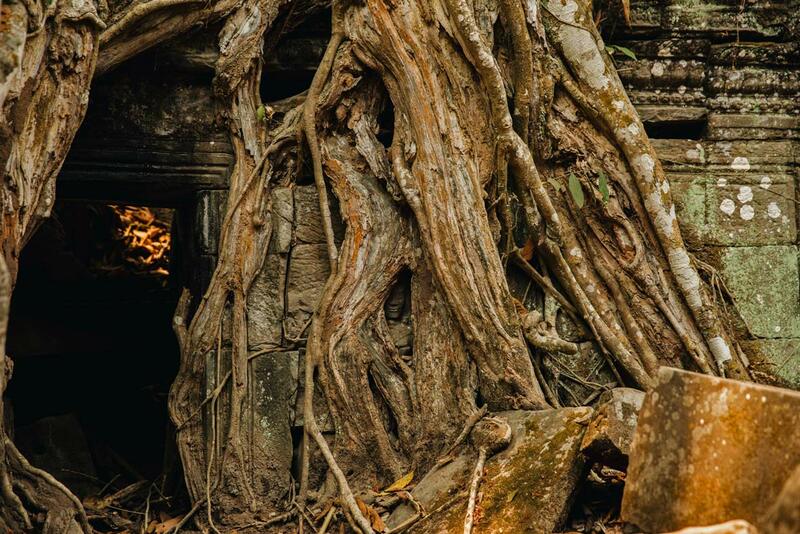 The overgrowth of vegetation at Ta Prohm has made it a popular destination for photographers – in many places appearing as if the surrounding jungle has swallowed up the entire complex of ancient temples. 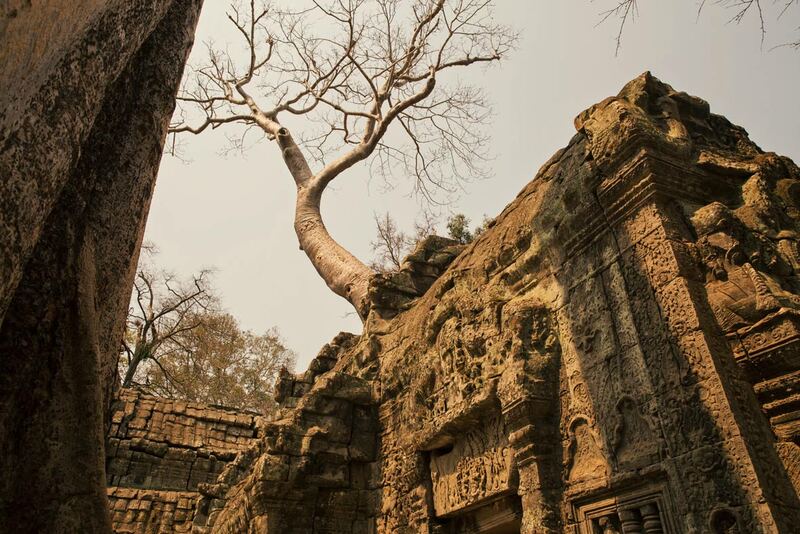 To the west of Ta Prohm is Angkor Thom, meaning “great city”, the last effective capital city of Angkor – and in the 12th century, it was then also the world’s largest city. 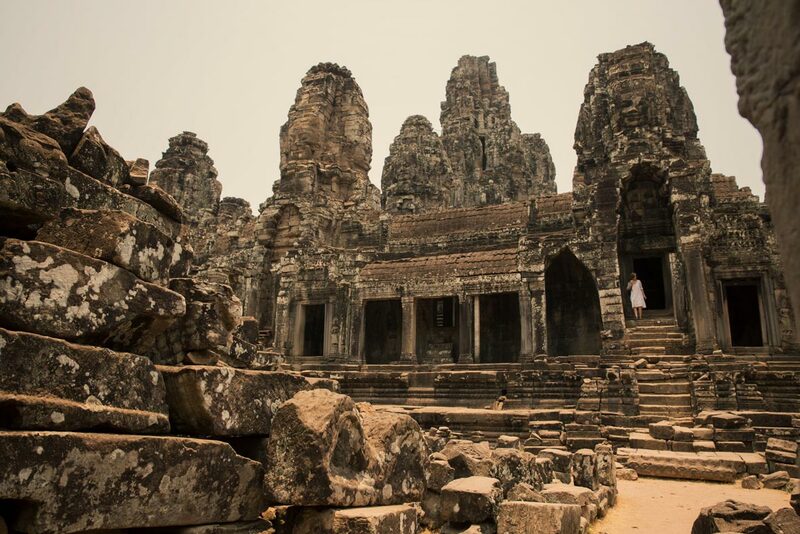 At the exact center of Angkor Thom is the Bayon, the famous Khmer temple, which at the top of its towers, features a multitude of serene, smiling stone faces. 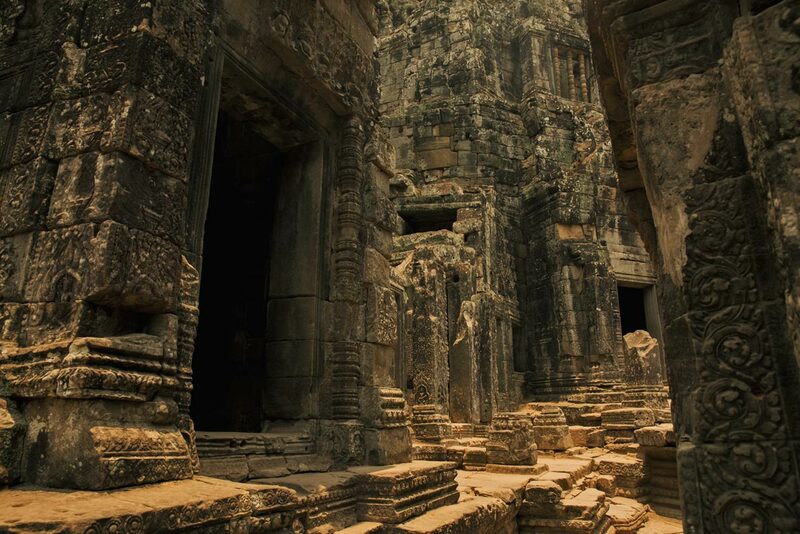 Reportedly there are over 2000 carved faces on this structure. 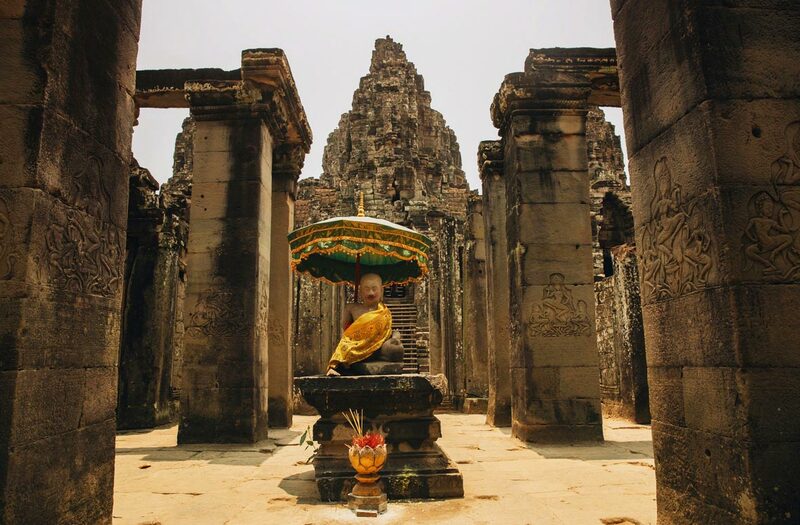 The baroque style and compressed claustrophobic spaces of the Bayon in Angkor Thom would be a stunning contrast with the classical ornate architecture and grand open spaces of Angkor Wat, which we head over to explore next. Now midday, at the height of the day’s intense heat, I have lunch just outside of Angkor Wat: a Cambodian fish amok, sticky rice mango with coconut milk, and fresh coconut water to drink. 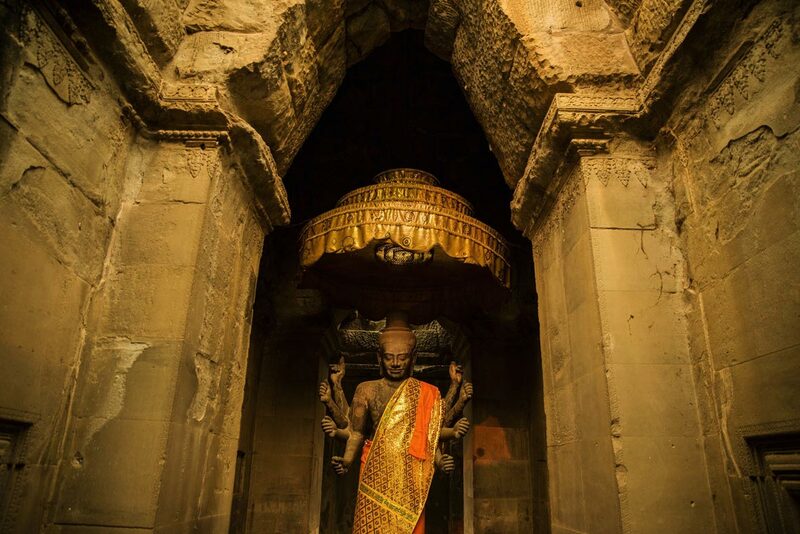 Although reluctant to head back into the heat, my guide and I are eager to continue exploring our last stop of the day – and so we cross over the famed moat of Angkor Wat and enter the temple complex from the main causeway. Once inside, I am amazed by the sheer scale and grandeur of the place. 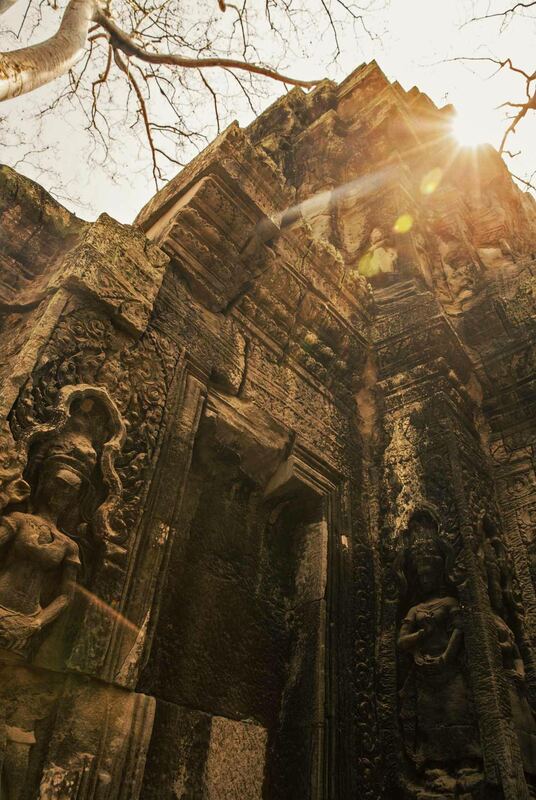 The best preserved temple of all in Angkor, Angkor Wat represents the high classical style of Khmer architecture. The amount of detail in its bas-reliefs and wall etchings is staggering. 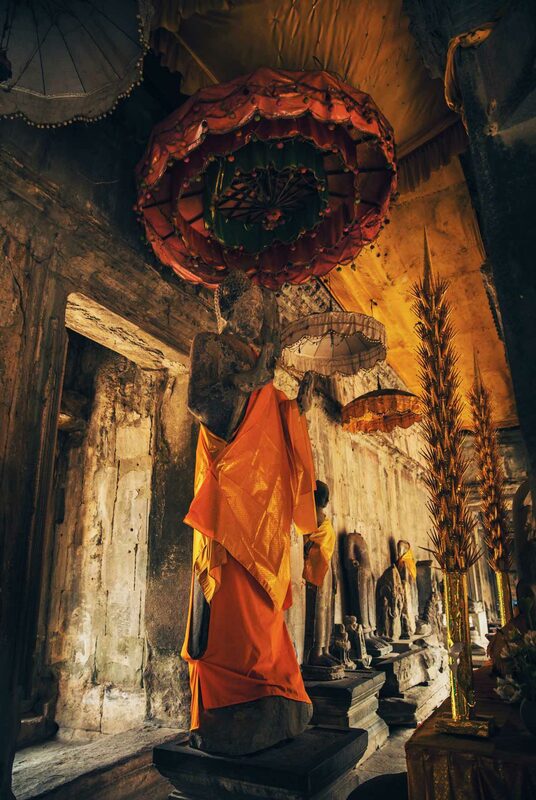 The largest religious monument in the world, Angkor Wat was originally built as a Hindu temple, then later transforming into a Buddhist temple and mausoleum for the Khmer King Suryavarman at the end of the 12th century. 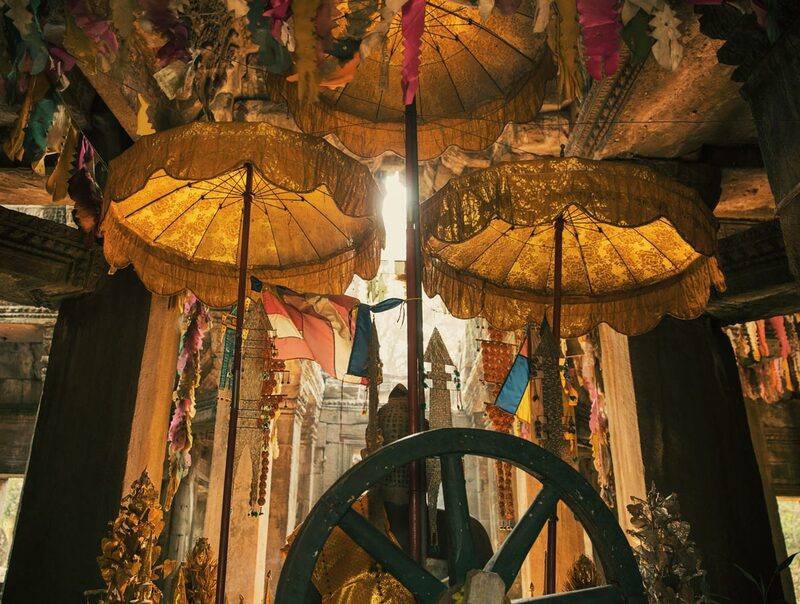 Today, shrines for both Vishnu and Buddha co-exist on the site and can be found at different locations in the complex. 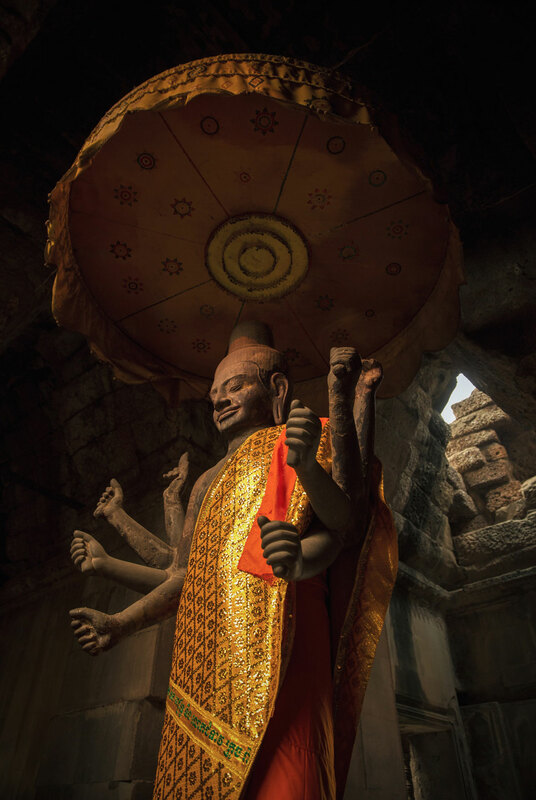 Because it is low season, I am fortunate to encounter fewer tourists in the temple and more religious pilgrims. 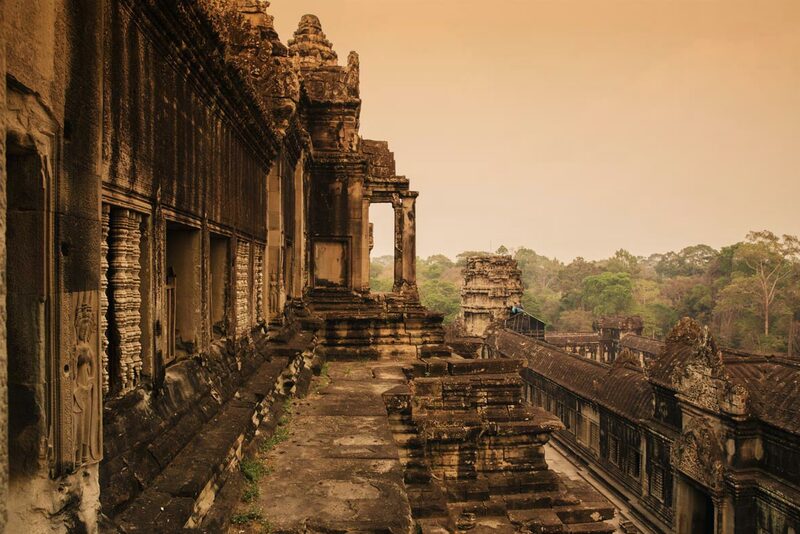 Climbing up to the highest point of the temple, I am taken back by some of the views overlooking Angkor. 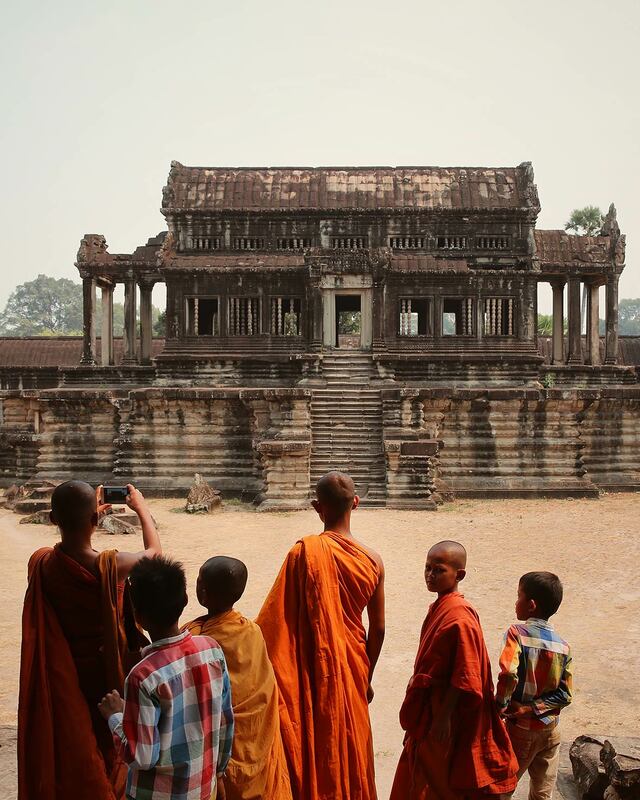 Standing from up there, it felt like time stood still – and it was easy to imagine what the former Khmer Empire may have looked like many, many centuries ago. It was the perfect ending to an unforgettable day in the heat.